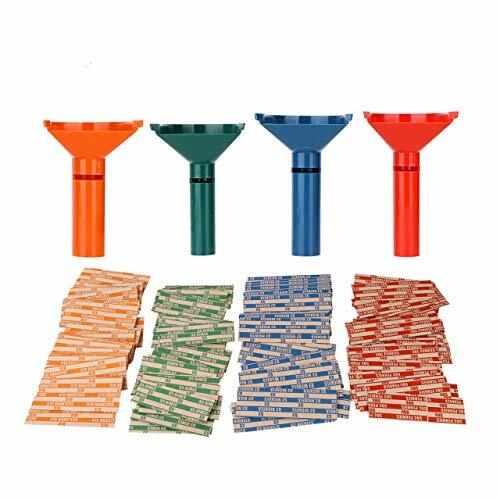 Budgetizer Coin Sorters and Counters Tubes come in a value pack of 4 tubes with 100 assorted Flat Wrappers. We pay attention to little details in all of the products we produced in order to keep your budget on track and better organized; our customers feel rewarded with extra benefits on each purchase so we guarantee quality and free wrappers on this one. 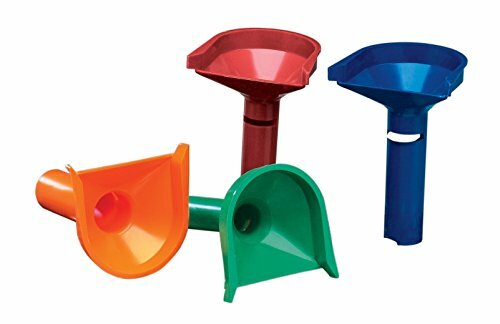 COLOR CODED - Budgetizer's coin tubes are designed with four coded colors to hold U.S Coins, Pennies, Nickels, Dimes and Quarters. Our Money Rolls have a perfectly sized design in order to get the perfect fit. Our coin wrappers are also color-coded distributed in the following designations: RED for Penny wrappers, BLUE for Nickel wrappers, GREEN for Dime rolls and ORANGE for Quarter rolls. MULTIPURPOSE - Works great for business, banks, office, restaurants, shops, individual or home use. 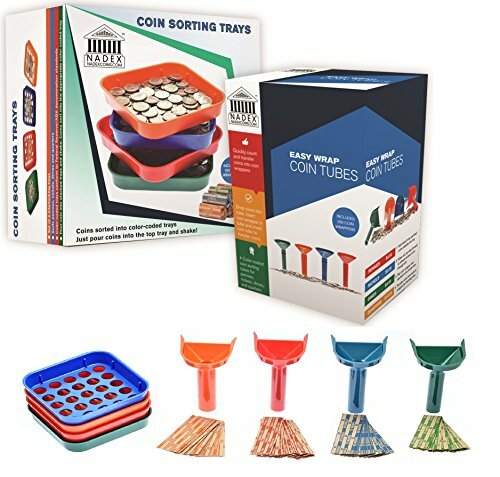 EASY TO USE - Budgetizer plastic coin sorter tubes are easy to use you just have to insert coin rolls into tubes, drop coins, invert and then coins are counted and ready to seal. WARRANTY INFORMATION - We ensure that our coin counter tubes and money wrappers bundle will meet your expectations. If for any reason, it doesn't, we offer returns without questions asked. If you have any issues, do not hesitate to contact us and we will be more than happy to ensure you have a positive experience. Wasting time sorting and counting coins? 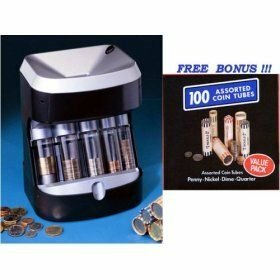 This bundle is what you need since it includes coin-sorting tray and coin counter tubes with extra wrappers. COLOR CODED - Budgetizer color-coded coin trays are made with high quality plastic ready to sort your coins. Just stack them, pour the coins into the trays and shake it, they do the rest. The trays are color-coded according to ABA and Federal Reserve denomination standards for your Pennies, Nickels, Dimes and Quarters. It's simple and time saving. This practical bundle combines 4 color-coded coin tubes. Budgetizer coin-counting tubes are designed to hold U.S Coins and easily transfer into wrappers. This makes the wrapping process a breeze! 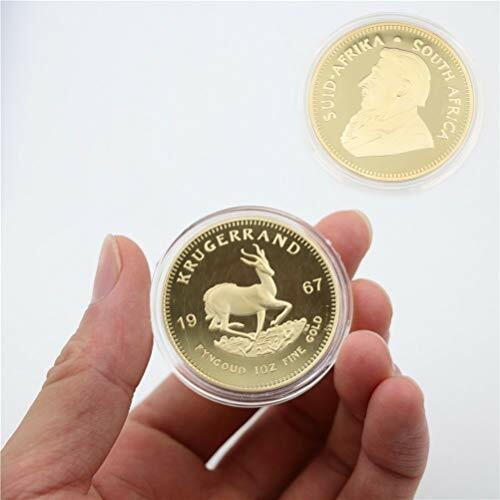 With the strategic design of the tubes to match the wrappers, you only have to insert coin rolls into tubes, drop coins, invert and then coins are counted and ready to seal. PREMIUM QUALITY AND PERFECT SIZE- Made with heavy duty Kraft paper, they have the perfectly sized design in order to get the perfect fit. With this bundle you will keep your budget on track since all your loose change will be either on the coin tubes or on the coin rolls. A Complete Solution to Coin Counting. The Cassida C200 is an all-in-one solution for any coin handling need. Easy to use, it counts, adds, batches, and wraps automatically. Easy to use The C200 recognizes individual denominations and sorts them automatically into large bins. No dials and no knowledge of coin dimensions required. Just load the hopper, press start, and walk away. Grand total of all coins is displayed and detailed reports for each denominations are within a button s reach. 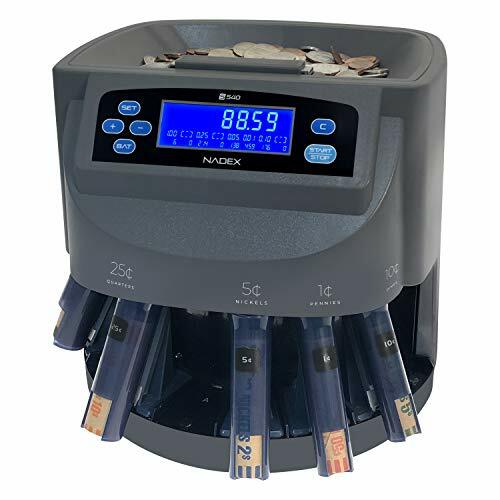 Counting, adding, and batching The C200 includes all the counting modes you would expect to find on a Cassida-designed coin sorter. Batch mode counts amounts as low as 1 coin or as high as 500. An easy-to-read LED display shows both number of coins and dollar amount for each denomination, as well as the grand total. One step sorting and wrapping It takes only seconds to exchange the C200 s bins for the included wrapping attachments. One button sets roll batch amounts for all denominations and C200 stops automatically when a wrapper is full, great for fast-paced environments where there is a need to switch between wrapping and bulk sorting. Fast, but quiet The C200 is quiet in operation, even when counting and sorting at 300 coins per minute! The Royal Sovereign FS-2D 2 Row Electric Coin Counter is the perfect solution for fast, convenient, and simple automatic coin sorting. This coin counter sorts at a high speed of up to 312 coins per minute. 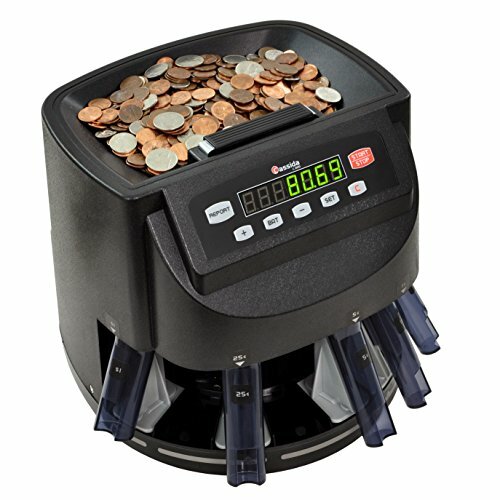 Count more coins at once with a large coin hopper capacity of up to 400 coins. This coin counter contains 2 rows of coin tubes for each denomination which allows the consumer to count more coins at once without interruption! When a coin tube is full, simply pull the coin tube forward, and the coin counter will continue to count and sort the remaining coins. The coins can easily sort into preformed coin wrappers for easy transition to coin wrapping and rolling. 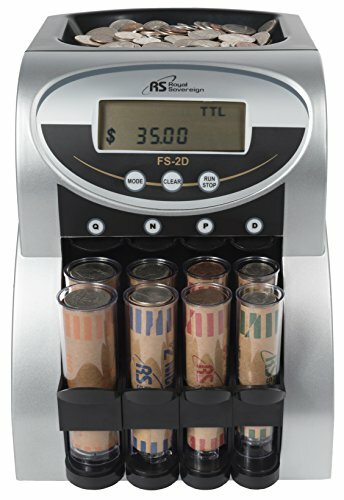 The FS-2D comes with Patented Anti-Jam technology that ensures precise internal sorting when counting coins and hassle-free operation. Value Counting is a convenient feature that comes equipped with this coin counter. An easy-to use front panel display shows the total amount of coins counted as well as total count by denomination. Fast Operation: Coin counter rapidly sorts up to 312 coins per minute. 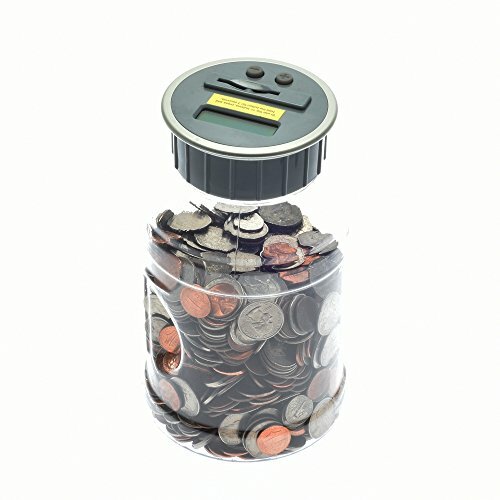 Large Capacity: Coin counter can hold up to 800 coins for consumer counting convenience. Count more coins at once! Effortless Wrapping: Straight to coin wrapper feature allows the consumer to insert preformed coin wrappers into the coin tubes. Easy transition from converting loose change into cash! Hassle-Free Operation: Patented Anti-Jam Technology allows for precise internal sorting when counting coins. Easy to Use: LED Display shows total dollar amount counted as well as total amount by denomination. Save time and headache by using our quick and affordable solution for your loose change needs. 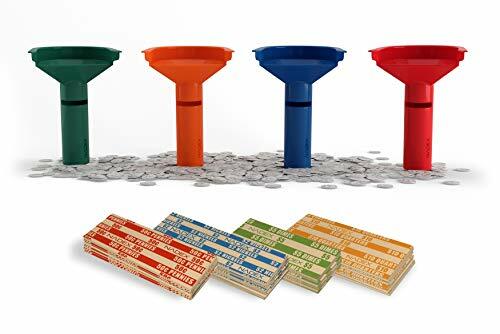 The Nadex Easy Wrap Coin Counting Tube Set contains four color coded plastic tubes that conform to Federal Reserve/ABA standards. 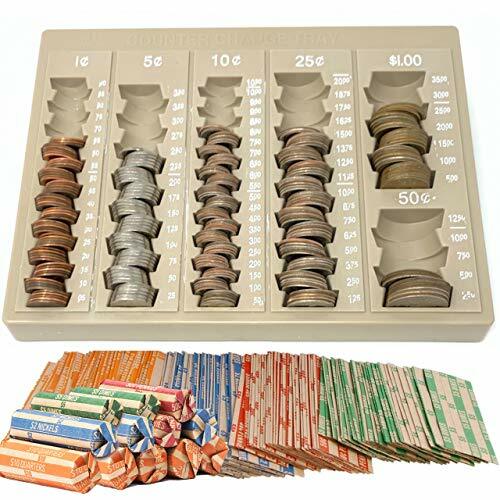 This coin counting set can be used for pennies(red), nickels(blue), dimes(green), and quarters(orange). Our engineering team worked countless hours to create a durable product while maintaining the quality and durability you expect with the Nadex brand. It is very simple to use this product, Step 1: Hold tube firmly and feed coins steadily into tray Step 2: When full, tip tube forward to release excess coins through slot Step 3: Slip coin wrapper over stacked coins inside tube Step 4: Transfer coins from tube to wrapper by turning tube upside down. 100% Lifetime Guarantee: Register your new Nadex Easy Wrap Coin Tube Set on our website to be eligible for our lifetime guarantee. We want you to be completely thrilled with this product! The Royal Sovereign FS-4DABK 4 Row Electric Coin Counter is the perfect solution for fast, convenient, and simple automatic coin sorting. This coin counter sorts at a high speed of up to 312 coins per minute. 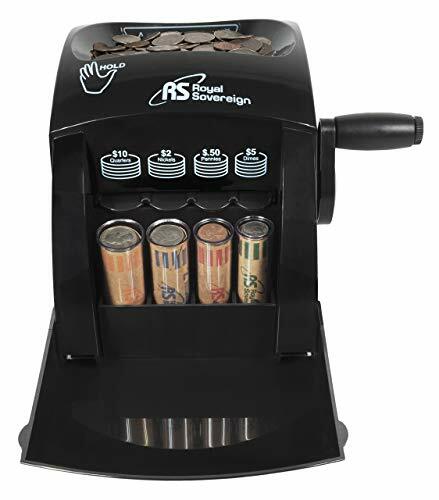 Count more coins at once with Royal Sovereign s largest coin hopper capacity of up to 800 coins. Automatic Row Advancement allows for hands-free operation for the consumer. When coin tubes are full, the tubes will automatically advance and the coin counter will continue to count and sort the remaining coins. The coins can easily sort into preformed coin wrappers for easy transition to coin wrapping and rolling. The FS-4DABK comes with Patented Anti-Jam technology that ensures precise internal sorting when counting coins and hassle-free operation. This coin counter contains 4 rows of coin tubes for each denomination which allows the consumer to count more coins at once without interruption! Value Counting is a convenient feature that comes equipped with this coin counter. An easy-to use front panel display shows the total amount of coins counted as well as total count by denomination. Hands Free Operation: 4 Row Coin Counter with Auto Row Advancement. When coin tubes are full, the tubes will automatically move forward and continue counting. Effortless Wrapping: FS-4DABK comes with a total of 16 coin wrappers. 4 per denomination (4 Quarter wrappers, 4 Penny wrappers, 4 Nickel wrappers, and 4 Dime wrappers). 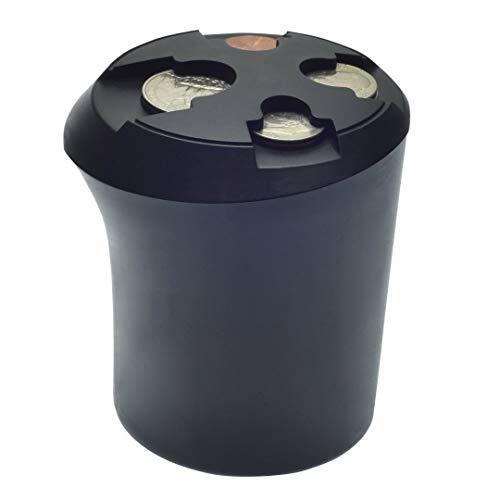 Type S Coin Holder by Winplus stores your loose change in a modern holder. Fits pennies, nickels, dimes, and quarters. Holds over $10 in change. Save time and money with the Nadex Color-Coded Coin Sorting Bundle. 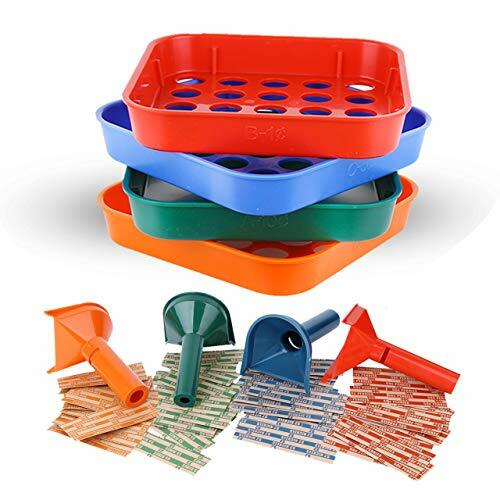 The bundle includes Four Color Coded Coin Sorting Trays and Four Easy Wrap Coin Tubes. Both products are color coded in order to help you quickly identify which tray or tube you need. Red(Pennies) Blue(Nickels) Green(Dimes) and Quarters(Orange). In addition to the tubes and trays, we are including 60 Free Coin Wrappers(20 each for Pennies, Nickles, Dimes, and Quarters). Also if you need a place to securely hold your coins, just type in the search bar, NADEX COIN MANAGER PRO which is also under the official NADEX brand. 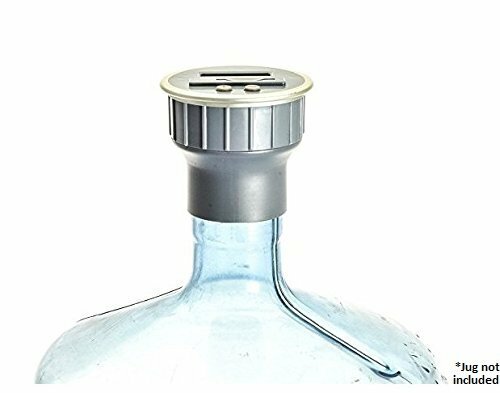  Coin bottle top is designed to be near universal and will fit around the neck, or is easily inserted into the rim of jugs and bottles of all types, 1-3/4" to 2-3/4" (45mm to 70mm) .  The sloping design of the screw-on attachment allows it to rest easily in or on the jar of your choice.  LCD digital display keeps an accurate coin count and auto shuts off when not in use. The Nadex Car Cup Coin Holder holds up to $15 of change. It holds pennies, nickels, dimes, and quarters and is compatible to fit in any car cup holder. Higher Quality, Lower Price: Your Nadex Coin Holder Pro is made using a molded ABS plastic frame in a beautiful matte black finish - all at a sensible price. Unbelievable Storage: Holds Quarters, Dimes, Nickels, and Pennies. Our internal tests have shown the holder has a capacity of up to $15 worth of change. Save Money: What's the number one thing that happens when you have quick access to your change? You won't have to break bills anymore. The Royal Sovereign CO-1000 1 Row Electric Coin Sorter is the perfect solution for fast, convenient, and simple automatic coin sorting. This coin sorter sorts at a fast speed of up to 240 coins per minute. Also included is a large coin hopper capacity that can hold up to 300 coins for consumer coin counting convenience. The coins easily sort into preformed coin wrappers for easy transition to coin wrapping and rolling. The CO-1000 comes with Patented Anti-Jam technology to ensure precise internal sorting when counting coins and hassle-free operation. An additional convenient feature is a collection bin that gathers loose change that spills over for easy clean up from your change counter! 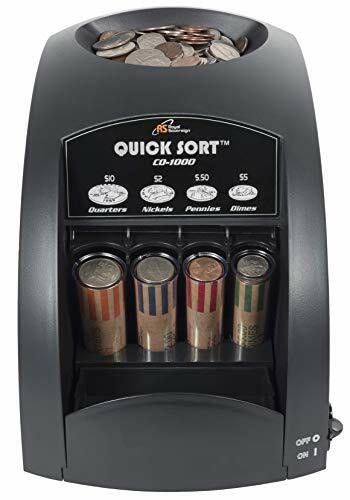 This coin sorter contains 1 row of coin tubes for each denomination as well as a quick and easy 1 button coin counting operation. Fast Operation: Coin counter rapidly sorts up to 240 coins per minute. 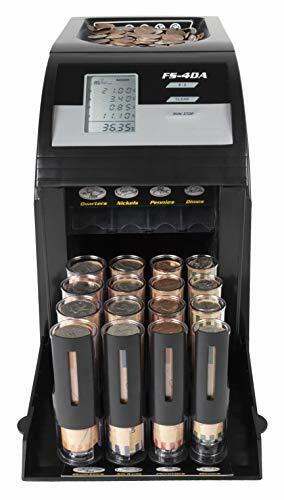 Large Capacity: Coin counter can hold up to 300 coins for consumer counting convenience. Count more coins at once! Effortless Wrapping: Straight to coin wrapper feature allows the consumer to insert preformed coin wrappers into the coin tubes. Easy transition from converting loose changed into cash! Convenient: Collection Bin gathers change that spills over for easy clean up from change counter. Accepts all U.S. Currency: Quarter, Nickel, Dime, Penny, Half Dollar and Dollar Coins. The Digital Energy digital counting coin bank is compatible with all u's Coin currency, including dollar and half dollar coins. The jar has an easy to hold handle indent for any size hand. An excellent and fun way to teach your kids to save their money and a great coin counting piggy bank for adults to keep their change in one place. Needs 2x acai batteries that are not included. Includes: Digital counting coin bank instruction manual retail packaging not included: 2 acai batteries. Surprise them with the Discovery Kids Automatic Coin-Counting Money Jar and watch their hard-earned cash pile up while keeping track of their finances! 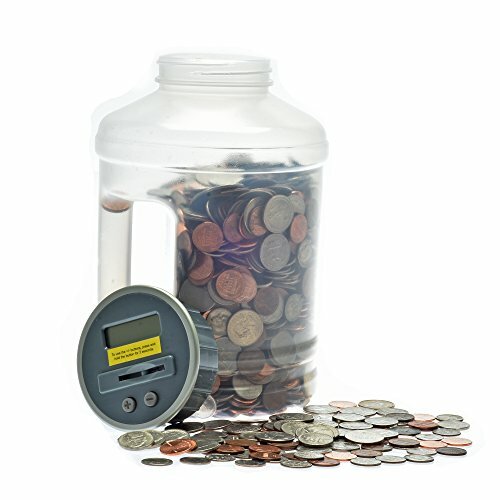 The money jar's intuitive design features a built-in digital LCD display and add/subtract buttons that monitors how many coins are placed in or taken out of the transparent container. A convenient twist-off lid makes retrieving pennies, dimes, nickels, and quarters easy for boys and girls! Your child will have a blast depositing their coins into the money jar while parents can enjoy seeing good financial and spending habits develop over time! What Are You Waiting For? Click "Add to Cart" NOW While Supplies Last! 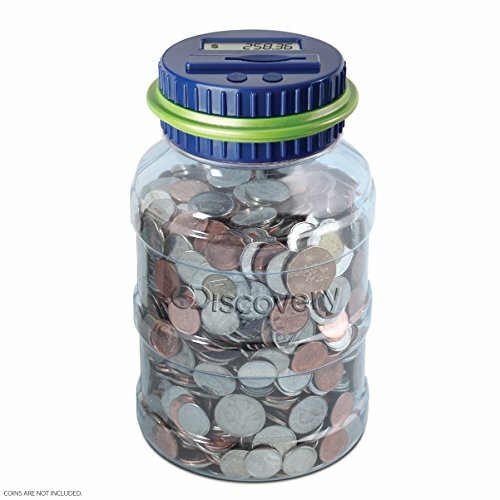 TEACH CHILDREN SAVE THEIR HARD-EARNED MONEY with the Discovery Kids Automatic Coin-Counting Money Jar! This interactive little bank stores all their loose change while keeping track on how much they're saving up! 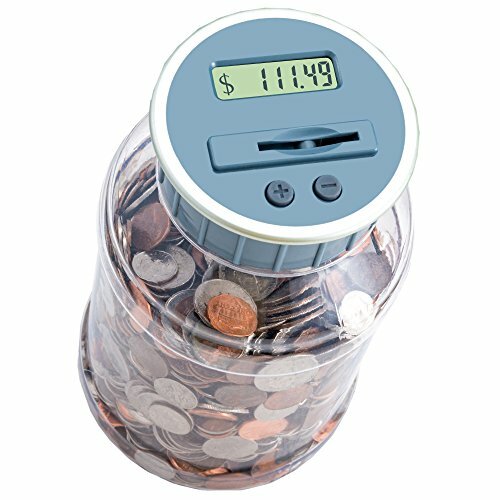 MAKE MATH FUN: The Automatic Coin-Counting Money Jar is a functional, educational, and engaging way for boys and girls to learn the basics of addition and subtraction! Your child can pass their coins through the lid's coin slot and the digital LCD display shows off how much they saved! Ready to withdraw? Children can also add or remove as many coins from the jar and then press the add/subtract buttons to reveal the total amount of change placed in or taken out. CHILD FRIENDLY BANKING: The money jar's transparent container allows your children to view all their savings at a glance while the twist off lid makes retrieving their coins simple and hassle free. ACCEPTS ALL U.S. CIRCULATED CURRENCY: The Coin-Counting Money Jar takes pennies, nickels, dimes, quarters, half dollars, and dollar coins! 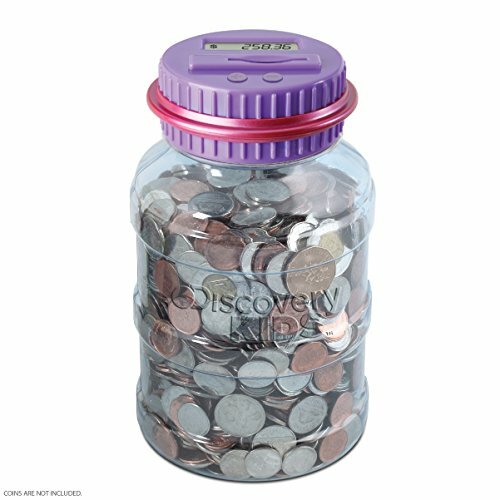 START GOOD FINANCIAL HABITS within your children today thanks to this nifty battery operated automatic money jar! It's an enjoyable way to have your child learn about the importance of saving and makes a great gift for any special event!  Update: As of 8/1/2018, All product issues regarding this product have been resolved. Extra large jug made of strong plastic. Great for all ages! Kids will love watching their savings grow and adults will value having a landing spot for their change! The Accu-Wrapper Motorized Coin Sorter sorts, stacks and counts coins! The machine sorts up to 20 coins at a time, at a speed of 220 coins a minute. Sorts the dollar coin. Holds $42.50 in coins. Includes a handy over-flow tray. Sample set of preformed wrappers included. Uses 2 "C" batteries (not included). Sorts 20 coins at a time. Come with 5 coin tubes and sample wrappers. Capacity: $42.50. Made in the USA. Kindly refer the Manual [PDF] and the video for troubleshooting steps. 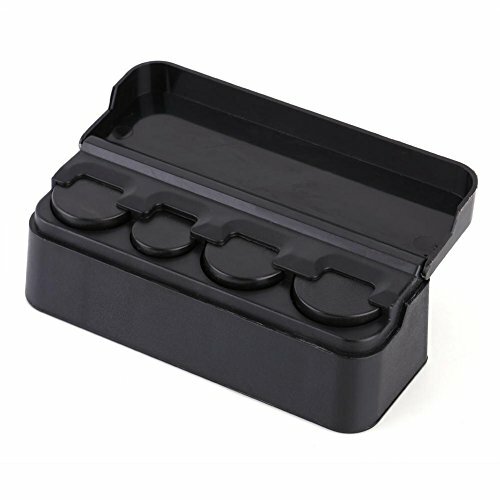 Are you looking for practical coin storage boxes to use as a coin counting tray? 6 USEFUL COMPARTMENTS - Our large capacity coin tray allows you to store 100 Pennies, 75 Nickels, 110 Dimes, 80 Quarters, 25 Half Dollar Coins and 35 Dollar Coins for a total worth of 83 dollars and 25 cents. Each compartment is clearly labeled for quick and easy coin counting and adding up totals. We prioritize quality which is why we make sure our money counter is durable as well as lightweight. BUNDLED WITH 64 COIN WRAPPERS - Budgetizer's heavy duty kraft paper coin wrap bonus includes 16 Quarter rolls, 16 Dime rolls, 16 Nickel wrappers and 16 Pennies wrappers. SECURE COVER - Unlike other trays, Budgetizer's tray counter give you the opportunity to place a lock to make sure your money is securely kept while you are gone or changing shifts. PERFECTLY SIZED - Each change tray measures 9.75 inches Long, 7.6 inches Wide and 1.6 inches Tall. IDEAL FOR BUSINESS OR HOME USE - Budgetizer's coins tray is the optimal coin counting tool for any business, restaurants, shop, bank teller or individual home use. WARRANTY INFORMATION - We ensure that our coin trays for safes will meet your expectations. If for any reason, it doesn't, we offer returns without questions asked. If you have any issues with our coin separator or coin counter jar bundle, do not hesitate to contact us and we will be more than happy to ensure you have a positive experience. ATTENTION COIN TRAYS ARE PAINTED BY HAND- Please know that there might be some extra paint on the trays since these are painted by hand. We know this and that is why we are giving you a very reasonable price for this product. The functionality is the same and the product is new. WARRANRY INFORMATION- if for any reason you are not satisfied send us a direct message and we will take care of you and make sure you have a positive experience, please just let us know! 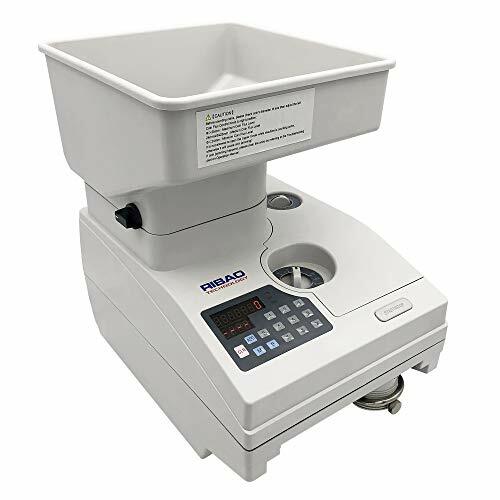 The Nadex S540 makes counting, sorting and rolling coins easy. Simply pour your coins into the hopper, press start, and the machine will automatically count and sort your coins. Coin Tube attachments are provided to automatically fill coin wrappers. Coin counting and sorting has never been easier. Know how much of each coin being sorted and counted by looking at the display. Press the start and stop button at any time to tally your coins. Machine will display both the total value and the number of each coins during counting. Coin tube attachments included to automatically fill preformed coin wrappers. Simply place the coin wrappers into the tubes, set the batch setting, press start, and watch them fill up. The machine will automatically stop when a roll is full. Coin Tray batch setting allows you to easily multitask. You don't have to watch to that the coin trays don't overflow. Simply set the batch setting, making sure that the coin trays are empty, and the machine will automatically stop when one of the trays are filled. The Ultra-Sorter Motorized Coin Sorter sorts, stacks and counts coins! The machine sorts up to 20 coins at a time, at a speed of 220 coins a minute. Sorts the dollar coin. Holds $42.50 in coins. Includes a handy over-flow tray. Sample set of preformed wrappers included. Ribao HCS-3500AH is a heavy-duty and high speed coin counting machine with motorized hopper.It has fast speed, extra large hopper and is suitble for counting big coins with diameter more than 30mm as well as plastic tokens. Countable coin size: Thickness within 0.8-3.8mm,diameter within 14-34mm. Hopper capacity: 4000 coins for coins diameter of 25mm and thickness of 2mm without the hopper extender, 18000 coins with the hopper extender installed. Power requirements: AC 120V %, 60Hz or AC 220V 10%, 50Hz. 1.Be sure to turn the main power off before daily maintenance. 2.Open the front panel completely and clean the coin runway and the countng sensor at least once a day with a brush. 3.Check whether the feed belt is dirty or worn. If it is dirty, clean it using a piece of soft cloth saturated with denatured alcohol. If it is worn, replace it with a new belt. 4.Please contact us if further service or additional repair parts needed. Important: Please refer to the User Manual before using it. We offer a 2-year warranty against manufacurer defect. Please feel free to contact us if you have any question on the product or the operation. Countable coins: All US, Canadian, Mexican coins, most tokens thickness within 14-34mm, thickness within 0.8-3.8mm,including plastic round tokens. Motorized hopper capacity: 4,000coins without the hopper extender installed, 18,000 coins with the hopper extender installed. The motorized hopper controls the coin flux to avoid jamming and assuring fast counting speed. Durable, heavy duty design: Every part of the machine is designed for heavy-duty use and easy operation, which can ensure 50,000,000 coins counting without changing any critical parts. Product Description The QS-1 manual coin sorter is the perfect sorter for business or personal coin sorting. This model is unique in that it requires no electricity or batteries to operate. Simply turn the hand crank and the QS-1 sorts pennies, nickels, dimes, and quarters directly into the 1 row coin tubes below. The large coin hopper holds up to 200 coins at a time. From the Manufacturer Since 1986, Royal Sovereign has been a global leader in money management equipment including, bill counters, counterfeit detectors, our patented coin sorters, and cash accessories. 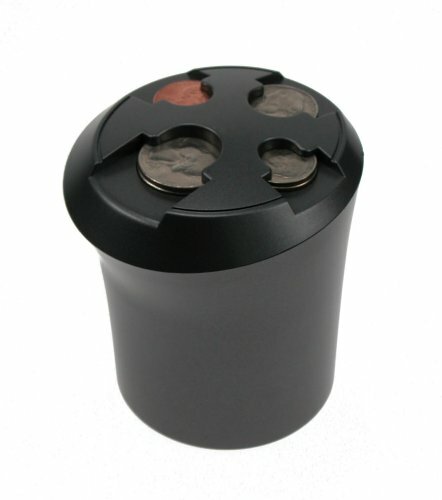 Large Capacity :Coin holder has four different holes for your coins. It will hold about 13 to 15 coins per hole, depending on the size of the coin. Thanks to the springs inside, the coins can easily be put in and out of the organizer. Functional Desgin :It is designed in a most convenient way; utilizing minimum space to provide maximum possibilities. It is fashionable and minimally stylished design. Superior and Durable : It is constructed from premium quality materials to ensure maximum strength and durability for long lasting usage. Practical Car Accessory :The coin case storage is a practical and affordable car accessory. The box helps you find the coins easily. Pefect Gift & Versatility :Pefect Gift & VersatilityYou can easily place this anywhere in your vehicle. You can also simply stick it on to your dash or console with some 3M tape. Also could be used at homes and offices. Be creative and start storing your coins! Four color-coded tubes (ABA colors) for pennies through quarters. (Coin wrappers sold separately.). Insert wrapper, invert and coins are counted and wrapped in one exact roll. Simply drop coins into tube until excess spills from slot. Simply drop coins into tube until excess spills from slot. Insert wrapper, invert and coins are counted and wrapped in one exact roll. Four color-coded tubes (red, blue, green and orange) for pennies through quarters. (Coin wrappers sold separately. ).